Everyday life is so frantic and full of troubles that we have largely forgotten how to live a joyful existence. We try so hard to be happy that we often end up missing the most important parts of our lives. In Mindfulness, Oxford professor Mark Williams and award-winning journalist Danny Penman reveal the secrets to living a happier and less anxious, stressful, and exhausting life. 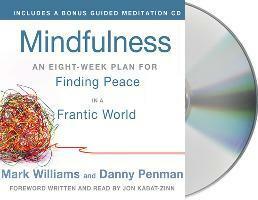 Based on the techniques of Mindfulness-Based Cognitive Therapy, the unique program developed by Williams and his colleagues, the book offers simple and straightforward forms of mindfulness meditation that can be done by anyone--and it can take just 10 to 20 minutes a day for the full benefits to be revealed. MARK WILLIAMS, PhD, is a professor of clinical psychology at the University of Oxford and a founding fellow of the Academy of Cognitive Therapy. He is the author of The Mindful Way through Depression. He lives in England. DANNY PENMAN, PhD, is a feature and comment writer for the UK's Daily Mail. After gaining a PhD in biochemistry, he worked for The Independent and the BBC. He lives in England.